Dona Alcina offers you well appointed AC and Non-AC rooms, furnished with all the amenities of comfort. Situated along the famous Candolim beach, its close proximity to the beach makes it the ideal place to spend time, 'Sun tanning' by the beach. With its informal casual ambience and warm hospitality it makes the perfect holiday spot with live band, cultural shows and folk dances to entertain you till late evenings. 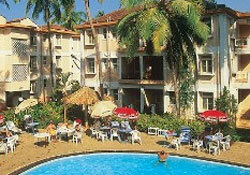 The resort also houses a cyber cafe, pool parlour, ayurvedic massage centre and various shopping arcades of interest.